When you select a Vorks solar energy system for your home you get more than the most powerful residential solar panels on the planet. Vorks offers a complete solar energy solution, from highest-efficiency solar panels and inverters to mounting system and energy monitoring. We ensure that the highest quality, best-looking solar panels reach your rooftop and produce the most energy for years to come. Vorks Solar system also comes with our 25-year performance warranty, so you get peace of mind knowing an established and proven company will be with you every step of the way. Vorks delivers the most reliable and most efficient clean solar energy. Single-source solution provider for integrated roof, wall, facade and solar PV solutions. Our system design and synchronization of solar panels with inverters ensure negligible loss of energy compared to other systems available. Services include project analysis / viability, design, supply, installation, testing, commissioning and handover service. PV modules are Ministry of Renewable Energy (MNRE) certified. 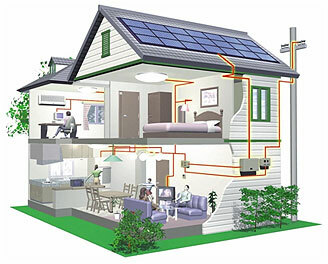 Integrated, value-engineered systems for quick and easy installation. Mono and polycrystalline PV technologies have a proven operational life of 50 years. The only cost-effective, widely accepted renewable technology that guarantees on-site electricity in an urban environment.